Game Center lets you play your favorite games with friends who have an iOS device or a Mac (OS X Mountain Lion or later). You must be connected to the Internet to use Game Center. WARNING: For important information about avoiding repetitive motion injuries, see Important safety information. Get started. Open Game Center. If you see your nickname at the top of the screen, you’re already signed in. Otherwise, you’ll be asked for your Apple ID and password. Get some games. Tap Games, then tap a recommended game or tap Find Game Center Games. Or, get a game one of your friends has (see Play games with friends). Play! 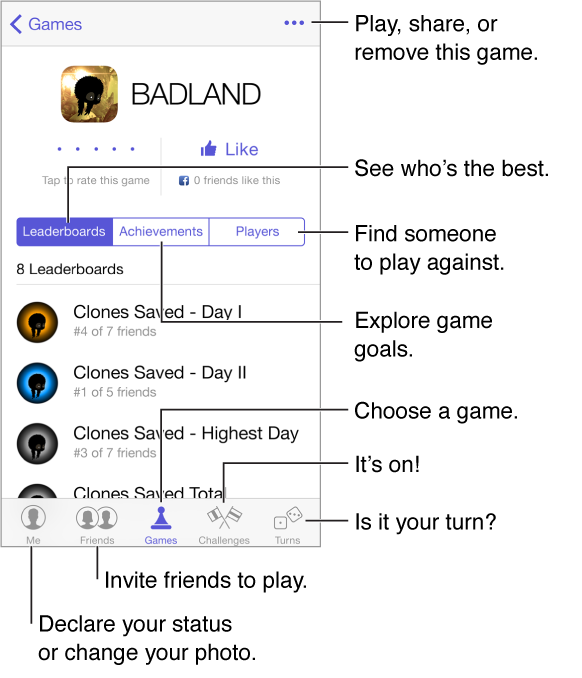 Tap Games, choose a game, tap in the upper right, then tap Play. Sign out? No need to sign out when you quit Game Center, but if you want to, go to Settings > Game Center and tap your Apple ID.